On Monday I had a video conference call with my friend Beth. 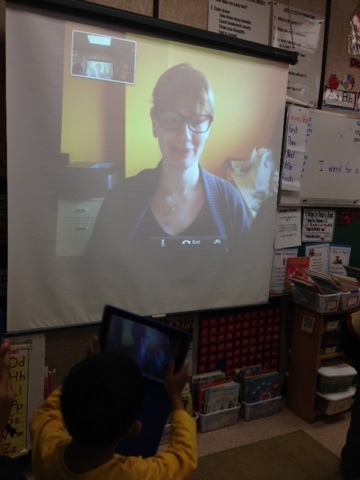 Beth is a video game programmer and she offered to speak with my class during our unit about "Jobs in My Community". Her tool of choice for video conferencing is FaceTime. Sunday night during the weekly #1stchat twitter chat - which takes place every Sunday at 5 pm PST - I mentioned that I had a video game programmer speaking to my class. Amy Rudd, another grade one teacher that I've met through #1stchat, asked if she could have her son join our conversation with Beth. He was really curious about this job. Now I teach in Surrey, BC, Canada, and they live in Ohio, a country and three time zones over. At first I was thinking to myself I can't make this work because with FaceTime you can only have one person on at a time. But then I realized that I could get them into our FaceTime conversation another way - through Skype. And we did. With my iPad, hooked up to the projection device with Beth video conferencing in through FaceTime, Amy and her son were on my laptop top on Skype listening in. A bit crazy eh? Beth spoke wonderfully to my students about her job. You can read more about that on our class blog. When she was finished it was time for questions. My students asked their questions with little difficulty as they just went up to the iPad and asked. But Amy's son had a question too. But instead of me relaying his question to Beth I put the computer in front of the iPad and let him ask it himself. Does anyone else besides me see the complete craziness in that? 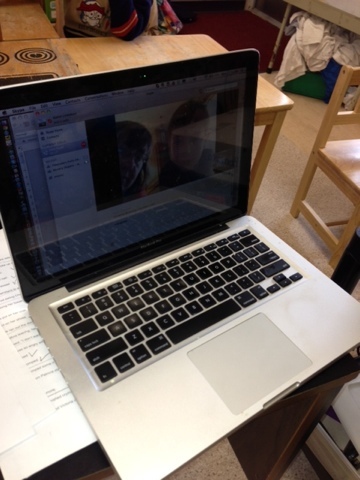 A boy, sitting in his home in Ohio was skyping into my classroom in Surrey, Canada to directly ask a question to my friend Beth who was in her own home using FaceTime to get into my classroom? Yes I really do think that's a crazy (in a great way) use of technology. But crazy uses of technology continued in this 30 min span. Just before we said goodbye to Beth many of my students took photos of her on the big screen so that they could put her picture on their blogs. As soon as she was gone one student let me know that he didn't get a photo. He was sad about this too because he was just waiting for the many children to move from the screen. I felt awful that I hadn't noticed but said that I could share one of my photos with him. Those words came out easy enough from my mouth but was it really that easy? Because my iPad was being used for the FaceTime call I resorted to my phone to take the photos. The thing is the iPads my students use do not have any e-mail on them so I couldn't just e-mail a picture to him. I needed another way. Here's where it gets a bit crazy, again. I e-mailed a photo from my phone and opened up that e-mail on my laptop. Then I saved the photo to my dropbox. I went to my student's iPad, opened up my dropbox account on his iPad and saved the photo in his photo roll on his iPad. And presto he uploaded the photo from his camera roll and wrote about Beth. Does anyone else see the nuttiness behind this photo transfer? Both of these crazy adventures happened within a 30 min period of time, after an inside lunch recess. Do you have some stories of ways you've used technology in totally crazy ways with your students? If so please share. ooVoo? I need to check this out. In my class we typically have a "google hang out" when there are more than two classrooms invovled. I'm smiling reading that my post has gotten you mind spinning because that is exactly what happens to me when I read blog posts. :-) Thanks for taking the time to leave me a comment. Just great! And it speaks highly to your positive attitude that you re-tell this story not as an example of why tech is terrible, but as an exapmle of how we can problem solve and make things work for the benefit of kids. Well done. Yes, my class and I have learned a long time ago that technology often doesn't work as we expect it should. But we have also learned how to problem solve, how to stay cam when things go wrong, and how to stay focussed on the goal. Thanks for taking the time to comment. 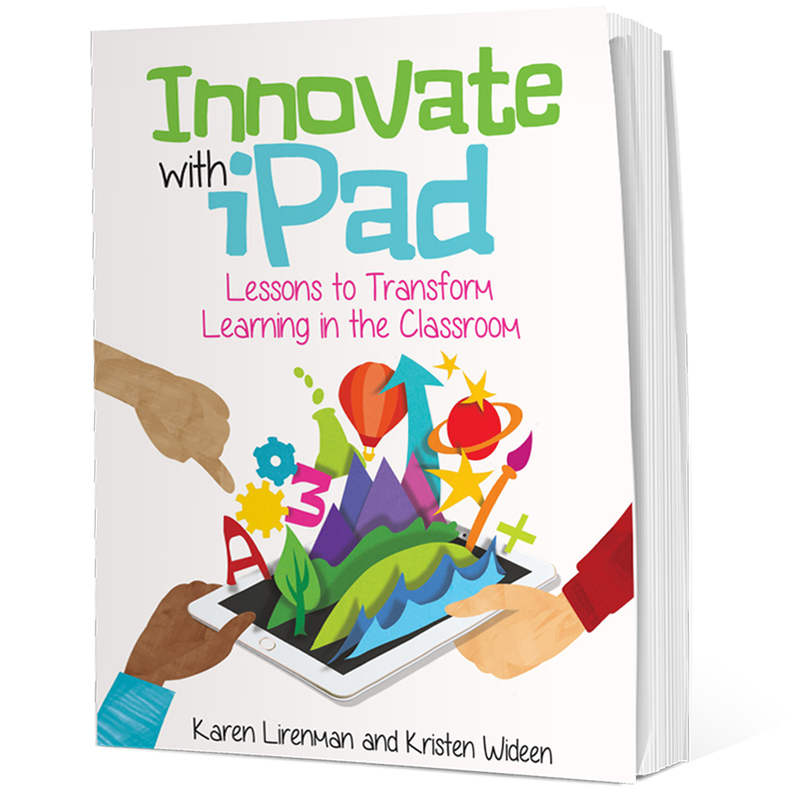 Karen, I had to comment on this post because I'm so impressed with the many ways that you used technology with your students. I'm glad that you could problem solve all of these small issues, and show just how wonderful technology can be (especially when combined with other forms of technology). My crazy tech story is no where near as crazy as yours, but this year I had a student away in Florida for 2 weeks, and she chose to FaceTime in for a Math Lesson and a Social Studies Planning Activity Time. When she FaceTimed in for Math, she not only stayed for the lesson and asked questions, but she even joined a group later, and planned with them from Florida. Then a few days later, she FaceTimed back in to work with her Social Studies group, and even used texting to share files with her other group members. It's amazing what technology allows us to do! Your ability to adapt and work with any technology available has truly inspired me. It's an intimidating task to me, as a pre-service teacher, to consider using technology and relying on it for a lesson, yet to adapt and use such variety of technology in a classroom is truly inspirational. This post has demonstrated how technology can be used and adapted to meet any need you have in your classroom. 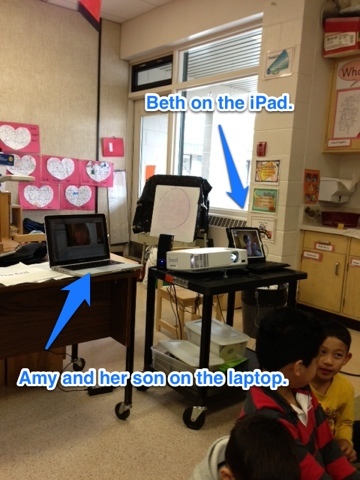 I LOVED reading this post and hearing about your experience with Facetime and Skype. 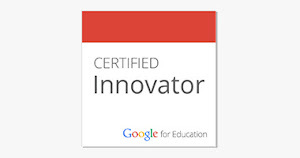 It's great to see teachers willing to use, and not to be intimidated by, the technology they have available to them.